Hello everyone! 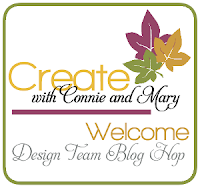 Welcome to another Saturday blog hop with the Create with Connie and Mary designers! This week we are featuring more great Fall projects but keeping it simple. I am your stop after the fabulous Debbie Henderson! 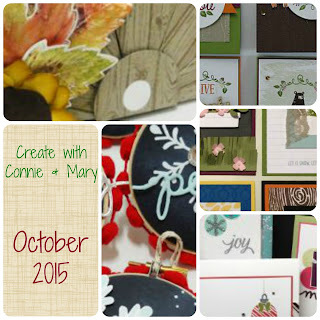 Before I send you on, I want to give you a sneak peek of what's to come in the October Create with Connie and Mary mini edition! Lots of very fun projects for the fall and Christmas season! Check it out! I hope you will plan to join us for this month's edition! Time to send you on to see what the fabulous Connie Babbert has created! Thanks so much for stopping by and have a super day! This is a very, lovely card!!!!! Might just have to CASE this one!